Sugarpill Chroma Lust in Goldilux ($12.00, 5g net weight). When I first unscrewed the lid, my reaction wasn’t wholly positive. There’s no sifter, no lttle plastic inner lid… you’re straight into the shadow, which makes for a slightly messier experience than my MAC pigments. Goldilux is a true yellow-gold with no visible hints of copper or bronze. 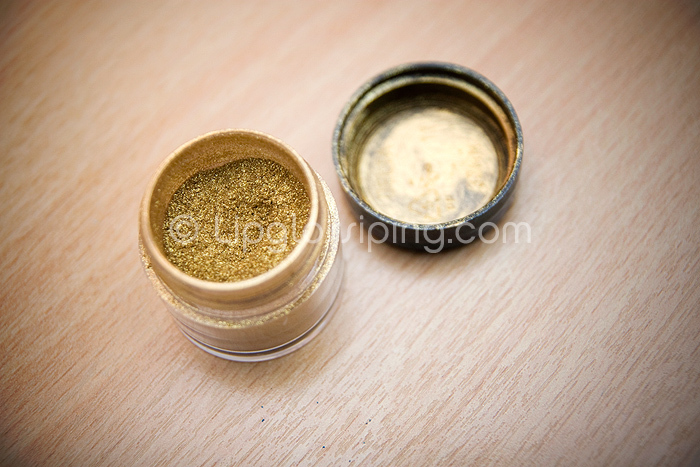 The sparkle is uniformly coloured to match the overall pigment. Measured in weight, this pot was a little less filled than Starling, but it’s still gonna take me forever-and-a-day to even make a dent. 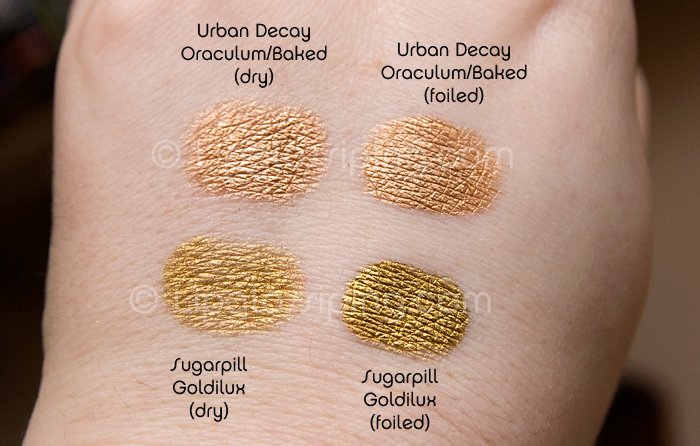 I chose to compare my Sugarpill Chroma Lusts to a ‘simillar’ shade from the Urban Decay Alice in Wonderland palette simply because it’s a current cosmetic item that I know many of you will now own. I’m not dupe-hunting, I just thought it would be a good choice for comparison to get an idea of pigmentation. Honestly? I’m a touch underwhelmed by how Goldilux looks applied dry. Before the swatch test, I was totally happy with the pigmentation but compared here to UD Oraculum/Baked, I think I was expecting a little more oomph from the Sugarpill Chroma Lust. In all fairness though, I also wasn’t expecting just how completely amazing it would look foiled (applied wet). I think it’s safe to say that in the case of Goldilux, the shadow’s real strength is in it’s foiling. I’m not going to go into detail on the other aspects of review for an eyeshadow, everything is fine… blendability, longevity over UDPP great (average otherwise). I will say that I still found it quite easy to blend after foiling which is a plus point, it doesn’ t dry with unblendable harsh edges, a positive point to note. Very happy with my Sugarpill Goldilux, and I’m blown away by how it looks applied wet. A liquid metal masterpiece. I have a really nice gold that’s about that good (and applies well dry) from Aromaleigh, but it was limited edition and is sold out now. It’s called ‘Party Dress’. If I ever use it up I’ll consider getting this one. It’s a shame there’s no sifter though, I really like being able to control the mess!